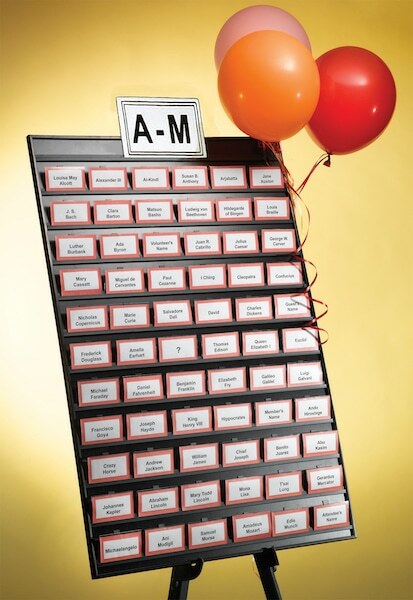 The large Name Tag Tamer Wood Frame®² displays up to 66 – 2¼” x 3½” or 55 – 3” x 4” name tags or cards and comes with a carrying case and a sign holder. The original Name Tag Tamer comes with a basic plastic frame. However The Name Tag Tamer Wood Frame comes with a beautiful wood frame choice of either Bombay Mahogany or Golden Oak¹. Both the board and case are lightweight and durable to ensure easy transport and longevity. 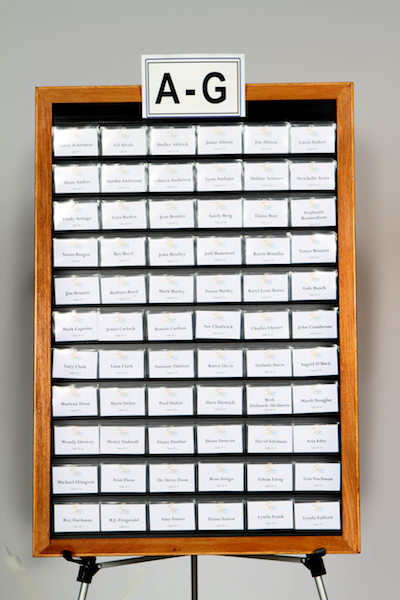 Name Tag Size Choose an option2 1/4" x 3 1/2"3" x 4"
The wood frame provides a professional touch to your event. Making the best first impression starts at the registration table. The Oak frame provides a classic dressed-up picture frame like quality. But for an even more formal event you may want to choose the darker Mahogany frame to make an elegant impression. These wood frame choices are very impressive and will elevate your event in the eyes of your guests. 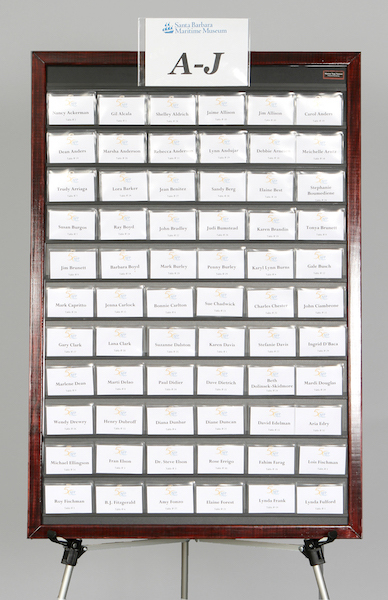 Event hosting registration has never been easier than now with these name badge display boards. 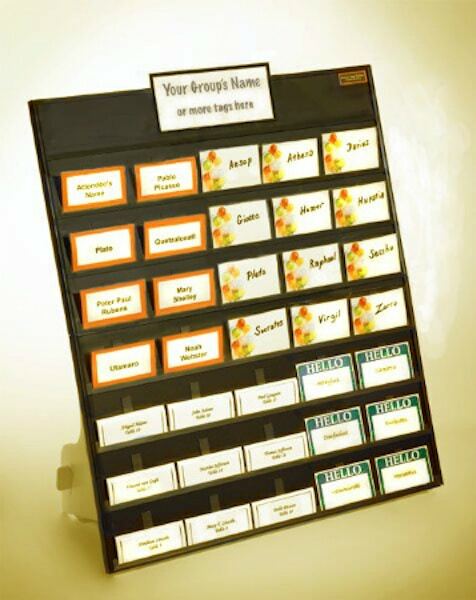 For more information on setting up and using our products visit Name Tag Organizers Make Hosting Events Easy. You will find helpful tips and name badge organizing ideas to make your events more professional and run smoothly. 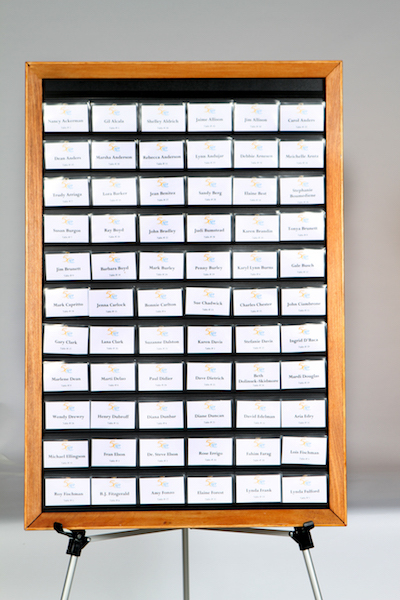 For larger events consider using several Name Tag Tamer in tandem and spread them out to avoid congestion. 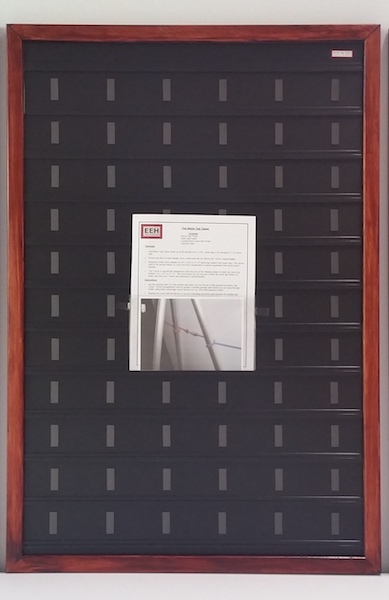 Outstanding Reviews of our Name Tag Tamer Wood Frame! Both the board and case are lightweight and durable to ensure easy transport and longevity. Standard 2¼” x 3½” or 3” x 4” clip tags can be preset in the office and with normal handling, will stay in place during transport and be ready for set up at your event. If you cannot find what you are looking for, custom orders can be discussed by calling (805) 259-3835 or completing our Contact Us form. Name tags and easel not included. 2 1/4" x 3 1/2", 3" x 4"